Suzuki’s all-new Celerio, which replaces the popular Alto mini hatchback in South Africa this month, has been created to provide buyers of small cars with a generous and enjoyable motoring experience. The newcomer proves that compact doesn’t need to be cramped, and that space and style don’t have to cost a fortune. Developed for world markets, and already a top seller in India, the Celerio reflects Suzuki’s unrivalled expertise as a producer of compact cars and SUVs with a concept that combines the user-friendly dimensions and wieldy road manners of a small hatchback with a surprisingly spacious interior and a voluminous luggage compartment. At the same time, the Celerio’s efficient drivetrain delivers zesty dynamics, combined with economical fuel consumption. Its low CO2 exhaust emissions also endow the new Celerio with impressive environmental credentials. 1,53 metres, which ensures an unusual level of headroom. And thanks to an extended wheelbase, short overhangs and space-saving suspension, interior space is maximised – as is the luggage compartment. The Celerio matches its efficient packaging to attractive, modern styling. A prominent chrome grille with broad, horizontal bars is the dominating feature, while bold headlights add to the car’s expressive ‘face’. The Celerio features Suzuki’s CICO (Curve In, Curve Out) design. Strong style lines demarcate the flanks and the shoulder line of the hatchback, contributing to a sleek and streamlined impression. The rear is dominated by the large tailgate, which opens down to bumper level for convenient access to the cargo compartment. 6 000 r/min, combined with a torque peak of 90 Nm at a relatively low 3 500 r/min. 108 g/km – well below the emissions tax threshold. That translates into an impressive operating range of more than 750 km from a single 35 litre tank. The Celerio is the first Suzuki model to be fitted with the marque’s new automated manual gearbox, which allows clutchless operation of a manual gearbox without the energy losses usually associated with conventional torque converter-based automatic transmissions. Instead, it uses an electro-hydraulic actuator to change gears without the need for a clutch pedal. The system offers both full auto and manual shift modes, and ensures a smooth shift action by synchronising clutch control, gearshift action and engine speed. A creep function allow smooth operation in stop-start city traffic, too. Benefits of the automated manual gearbox include reduced weight, greater fuel efficiency, affordability and a fun driving experience. 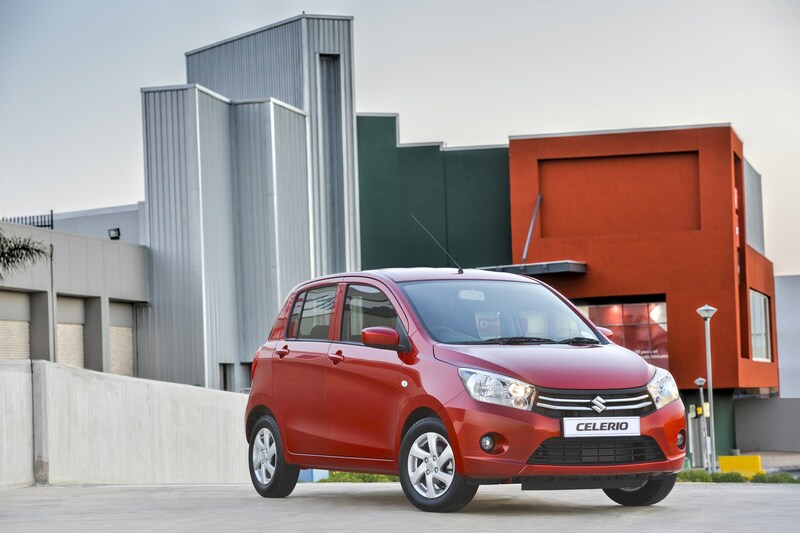 It also ensures that the Celerio becomes the most fuel-efficient automatic transmission car in South Africa. The Celerio’s efficiency and practicality are linked to a high degree of active and passive safety. Dual front SRS airbags, an ABS anti-lock braking system, inertia reel seatbelts, childproof door locks and a high-mounted third brake light are all standard. “The new Celerio follows in the successful footsteps of our popular Alto mini hatchback, but offers significant advantages as far as space, practicality, style and overall refinement are concerned,” says Yukio Sato, managing director of Suzuki Auto South Africa. The new Celerio has been designed and developed as a global car, and is produced by Suzuki in India and Thailand for export to world markets, including South Africa.